Quick & Cost-Effective Inspection and Trimming Services in Indiana. When products are molded at a plant, no matter if a machine knocks off the most excess material, there will still be bits and pieces hanging on. 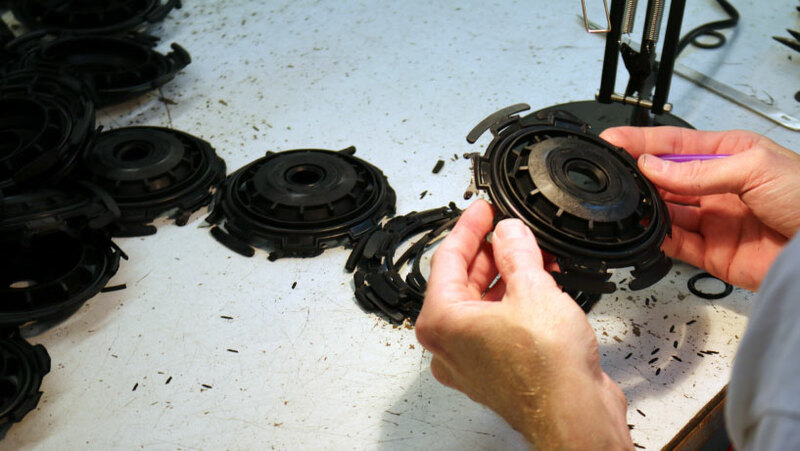 We inspect and trim off the remaining parts to leave a clean and smooth finish before your products are shipped to your customer or end-user. All of the flash has to come of for safety, quality of fit and a professional finish. As an ISO 9001:2015 certified company, we adhere to strict quality standards and can handle a wide range of project complexity. We work directly with the our clients. We build custom solutions for your inspection and trimming challenges. Federal Assembly performs trimming & de-flashing services daily. Our team has the knowledge and experience to handle, inspect, trim and ship any sized job. Need a Trimming & De-Flashing Project Facilitated? LET US PUT IT TOGETHER! Federal Assembly, Inc. has built a solid record of providing quality parts inspection, complete product manufacturing, refurbishing, assembly and quality resident engineer services. Count on Federal for superior quality, service, and value.